With former Bihar Chief Minister Jitan Ram Manjhi sticking to his demand for more seats, finalization of a seat-sharing arrangements by BJP with its allies for the assembly polls in the state eluded on 12 September even as hectic talks continued throughout the day. According to sources, Manjhi on 12 September met BJP President Amit Shah at the latter's residence twice and held seat-sharing talks when he demanded more seats from BJP for his Hindustan Awam Morcha (HAM). There were plans to declare NDA's seat-sharing plans today after its senior leader Ananth Kumar said so in the morning. 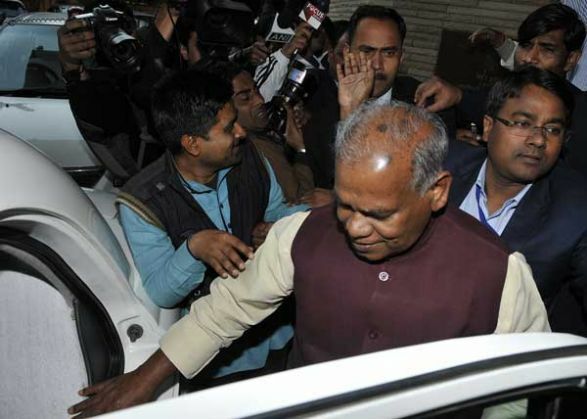 Manjhi expressed unhappiness over the 15-odd seats offered to HAM and further talks with him will be held tomorrow. HAM has been offered around 15 seats and the five outgoing MLAs owing allegiance to him have been asked to contest on BJP tickets. Rashtriya Lok Samata Party's (RLSP) Upendra Kushwaha, also an ally of NDA, also met Shah this morning and later said he has authorised Shah to finalize seat-sharing. While BJP plans to contest on around 160 seats out of a total of 243 seats, RLSP is being offered 25 seats while Ram Vilas Paswan's Lok Janshakti Party around 40, it is learnt. Seat-sharing talks among NDA allies started since morning and continued till late at night at Amit Shah's residence. After Manjhi's disapproval over seats offered to him, BJP Bihar core group held its meeting late in the evening to discuss seat-sharing.